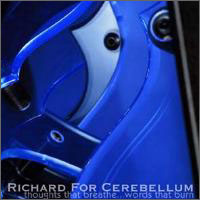 Richard For Cerebellum is the brain child of Lorren Stafford, Minneapolis based composer & classically trained pianist, cellist, and violinist. Most of the pieces on 'thoughts that breathe...' were written and recorded over a period of 10 years from 1987 to 1997. After the record was completed, it was buried in a deep, dark crypt for 7 years before clawing its way out of the grave and onto the Zhark roster. Conceived as a film score to a non-existent film, "thoughts that breathe..." brings classical chops, an epic sense of vertical density, vast chasms of contrasting elements and a diverse sonic palette to bear on this coherent collection of musical landscapes. Traditional instruments such as guitar, cello, clarinet and string sections share the orchestra pit with samplers & synths, found instruments, field recordings, circuit bent instruments, cutting edge software, and arcane audio electronic devices. Lorren currently produces music as Slutmachine (Zhark) and collaborates in a diverse collection of projects: the organic-electronic duo, low orbit; ultra dense improvisational guitar/cello freakout Panzram; experimental noise/ambient project Nautipuss; and the doom drone/breakmetal monster, Treachery (with fellow Zhark mates Rachel Kozak & Martin Frank). Lorren is also the founder and owner of Blackbox Music Electronics, designer and manufacturer of boutique guitar effects and music electronics.